The light being shed on the current GMP regulatory expectations for risk management and manufacturing control of combination products by FDA’s inspection engagement with pharma sponsors and their device partners has been a focal point at recent conferences in the US and Europe. Industry and regulators in the US and Europe are wrestling with how best to interpret and communicate drug quality-by-design (QbD) concepts, device design controls (DC) and overall final product risk management in the drug/biologic/device combination product context. 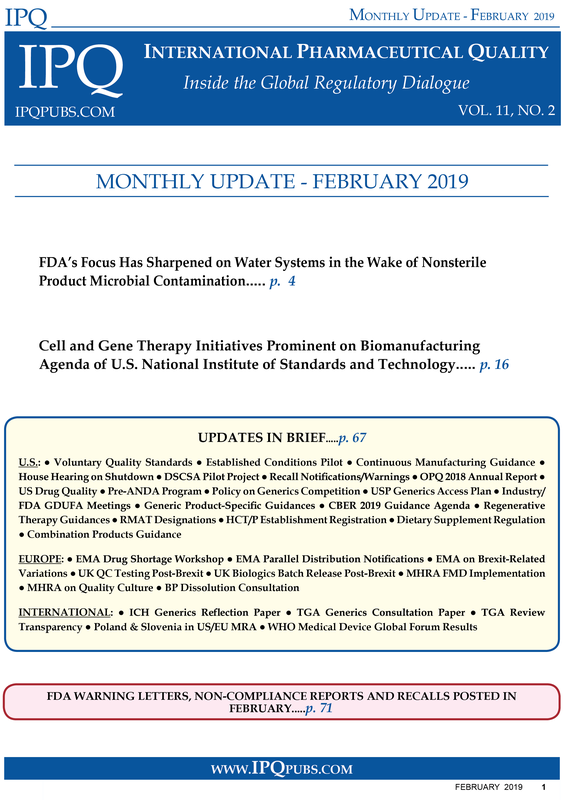 During January and February, IPQ was focused heavily on the emerging challenges faced by regulators due to the rapidly increasing number of applications encompassing new products and therapies, technologies and processes. The three stories in this issue explore: ● how FDA’s generic drug review process is evolving with user fee support to address the increasing number and complexity of products emerging through it ● how CBER is responding to the wave of advanced therapies it is now facing, and ● a CDER/CBER view of the current biologic product CMC review landscape and the BLA challenges, accomplishments, and learnings. The opening plenary session of the 2018 CASSS Well-Characterized Biotechnology Products (WCBP) Conference, brought together a panel of FDA senior officials engaged in the CMC review process for biological products to assess the 2017 learnings and what the agency and industry needs to do to address the regulatory challenges and stresses going forward. Regulators facing the diversity and complexity of advanced therapies are being challenged with achieving the right balance between providing the regulatory flexibility needed to foster their development and assuring that CMC processes are in place to maximize product safety and avoid the mishaps that could significantly derail their progress. FDA’s Office of Generic Drugs (OGD) is cautioning ANDA sponsors to pay more attention to making sure that current information is provided on all of the facilities involved in the development, manufacturing, control testing and warehousing of APIs and finished dosage forms in both the Form 356h and application module 3.2.S.2. Industry and agency experts engaged with advanced therapies are stressing that the communication process between them is critical in clearing the CMC pathway for development of the products and that this communication needs to happen as early and as openly as possible to help sponsors navigate around the many pitfalls that lie along the journey. The first two stories in this issue explore the drug GMP compliance concerns that are most pressing on the FDA agenda as 2018 approaches. The third story returns to the intensifying global dialogue on the stresses industry and regulators are feeling as they wrestle with how to advance drug/biologic/device combination products in the context of regulatory structures and processes not very well adapted to handle them.